Dietary fiber includes all food substances that our digestive enzymes cannot break down and utilize as energy. All fiber falls into two basic categories—water-soluble and water-insoluble—which are further divided into five subclasses: cellulose, hemicellulose, lignin, pectin, and gum. The health benefits of both soluble and insoluble fiber have been well documented. While the body may extract and use some of the nutrients contained in fiber, its primary purpose is to help the bowels function efficiently. The basic fiber structure passes through the digestive tract to flush the intestines and give more bulk to the stool. Soluble fiber may be found in oats, pectin, guar, barley, beans and sea vegetables. Soluble fiber is characteristically sticky and meshes with water to form gels. In addition, soluble fiber helps maintain normal cholesterol to manufacture even more bile salts. Insoluble fibers are typically found in wheat bran, whole grains, skins of fruits and vegetables, and nuts. Insoluble fiber absorbs large amounts of water, stimulates the intestinal tract, and provides gastrointestinal benefits. National food surveys reveal that the average American consumes only one-third of the fiber they need. While the Food Pyramid recommends five servings per day to fresh fruits and vegetables, the average consumption is closer to two. The average low fiber diet provides only 10 to 13 grams of fiber daily; current guidelines call for 25 to 30 grams of fiber daily. You can increase your dietary fiber intake by including a high-fiber cereal for breakfast, choosing brown rice instead of white, eating two to three pieces of fresh fruit with skins, and by adding high-fiber supplements to your diet. Digestive Aids - proper digestion is one of the body’s most important physiological functions in maintaining overall health and wellness. Maintaining normal digestion aids in proper absorption and elimination. Natural emulsifying agents and digestive enzymes are excellent aids to the digestive and absorption processes. Two important digestive enzymes are extracted from tropical fruits: Papain, from papayas, and Bromelain, from pineapple. Probiotics - researchers estimate that more than 400 species of bacteria inhabit the digestive tract. Some of these are the pathogenic, or disease-producing, bacteria. But other species are considered “friendly” bacteria. To an extent, digestive tract health depends on the condition of the friendly bacteria and the control they exert over the less friendly, pathogenic variety. Friendly bacteria are often referred to as probiotics for their multiple, interacting benefits. Some friendly bacteria, such as bifidobacteria, can thrive only in oxygen-free environments. Others, such as Lactobacillus acidophilus, require small amounts of oxygen and are known as microaerophilic organisms. As a result, friendly bacteria have the potential to play several roles. Friendly bacteria produce acetic, lactic, and formic acids which lower the pH in the intestine, thereby inhibiting growth of undesirable bacteria and enhancing the nutritional status by helping to digest food and manufacture essential vitamins. Solgar's Beta-Pepsin Tablets are free of starch, yeast, wheat, soy and dairy products and are formulated without the use of preservatives, artificial flavors or colors. To assure freshness and potency, store at room temperature 15°-30°C (59°-86°F). Store away from heat, light and moisture. † One pepsin unit is defined as that quantity of enzyme that digests 10,000 times its weight of coagulated egg albumin. As a dietary supplement for adults, take one (1) tablet up to three (3) times daily, preferably after each meal, or as directed by a healthcare practitioner. CAUTION: Do not take in cases of stomach or duodenal pain or history of ulcers. Other Ingredients: Microcrystalline Cellulose, Vegetable Stearic Acid, Silica, Vegetable Cellulose, Natural Peppermint Flavor with other Natural Flavors. 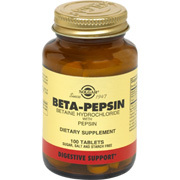 Beta-Pepsin is shipped in a discrete, unmarked package. Orders are processed immediately and usually take about 3 to 5 working days to be received. We do ask that you try it for 2 to 3 weeks to feel the full effects. Any information received is used only for order processing and shipping purposes. Your information, such as e-mail address, will never be disclosed to a third party.